Fiat Chrysler and Tesla entered into a car pool for EU regulatory purposes. Tesla is reportedly deriving hundreds of millions of dollars from this arrangement. Can they parlay this arrangement into multiple deals and grow billions of free cash flow? It seems unlikely Tesla will be tapping into this cash flow in '19. Fiat Chrysler (FCAU) started an “emissions car pool” with Tesla (TSLA) to avoid fines under European Union rules targeting CO2 emissions. According to the Financial Times, this means Fiat will be paying Tesla hundreds of millions of Euros. According to well-known bull Cathie Wood, it adds up to $500 million of free cash flow to Tesla. Unfortunately, it is likely EU regulations that prevent either carmaker from sharing specific details. To get to a more exact figure, we may have to wait for future quarterly earnings reports. However, I even heard people predicting Tesla would enter into additional partnerships to make even more money off its zero-emission fleet. That's not how it works. While this news is unquestionably good news for Tesla, it is just that. The new cars sold within the EU are considered a carmaker's fleet. If the average CO2 emissions of the cars in that fleet are above 130 grams/km, you get fined. The fines are dynamic, but they are pretty hefty. If you want to stay competitive, you basically don’t want to get fined. By 2020, the limit decreases to 95 grams/km. You can read about the basic regulatory background here. To stay compliant, Fiat will need to cut about 7 grams/km of its average fleet emissions. Not every car FCA sells needs to be below the limit. There are extra credits for cars with super-low emissions (think EVs) and for heavy cars with low emissions. EVs have super-low emissions and are heavy, which makes them very valuable additions. A special pooling option allows automakers to opt into a structure where their fleets are considered pooled. Automotive manufacturers may decide to form a pool for the purposes of meeting their obligations under Article 4 of Regulation (EC) 443/2009 (further referred to as the Regulation). Such an agreement will enable a group of manufacturers to be counted as one entity for the purpose of compliance with the joint target. It is flexibility allowing manufacturers to decide on the most efficient way of complying with the Regulation. In practice, this will mean that the Commission will each year calculate the specific emissions target based on the average mass of all new passenger cars of the members of the pool registered in the EU and cross-check it against the actual average specific emissions of CO2 reported to the Commission by the Member States for all new cars of members of the pool. The existence of this pooling structure benefits both leaders and laggards. For example, independently, Tesla wouldn’t be affected by this regulation at all. It would not derive a benefit or advantage. The pool system allows EV focused companies to “sell” their emission averages. Tesla is selling about 30K cars in Europe per year. Fiat sells about 700k cars in Europe per year. Both numbers can fluctuate quite a bit. 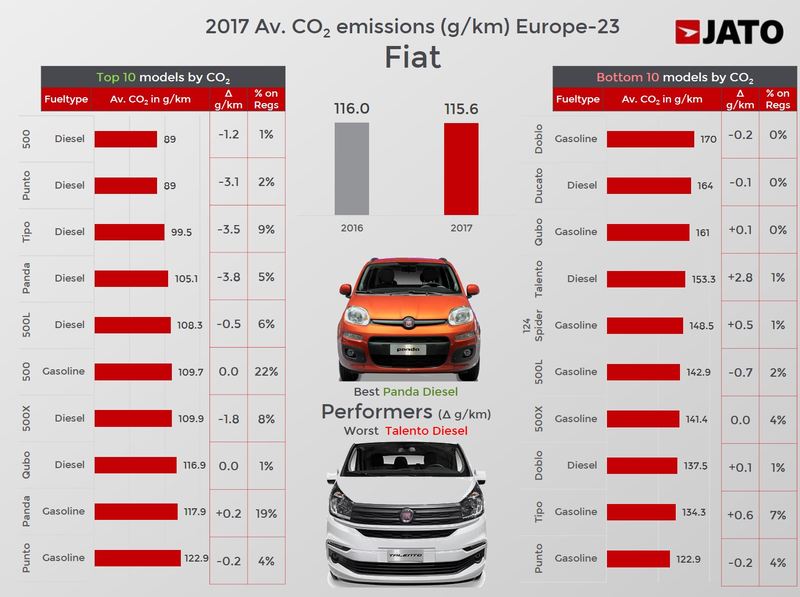 The JATO graphic below gives a rough idea of the CO2 emissions profile Fiat is dealing with. For Fiat, it should be near impossible to meet 95g CO2/km by 2020. Jefferies analyst Philippe Houchois put the total amount of fines at potentially $2.2 billion in both 2020 and 2021. Is it possible that Tesla will derive several hundreds of millions of dollars from this arrangement? I think so. Possibly, $500 million? It is possible. But the way a pool works, Tesla can “sell” its fleet into a pool only once. Sure, other automakers can also join an open pool, but that wouldn’t necessarily increase payouts to Tesla. If that automaker is also very efficient, it could mean the payout to Tesla gets diluted. If the automaker isn’t very efficient, that could mean Fiat derives less of a benefit or has its financial burden shared. The pooling system essentially functions as a market between automakers. Benefits accrue to Tesla and carmakers who are ahead of the emissions curve while allowing laggards the option to pay competitors instead of regulators. This could result in a few hundred million dollars of revenue for Tesla. Perhaps, two years in a row. This revenue is actually almost entirely unburdened by costs and will fall to its bottom line. However, that doesn’t necessarily mean hundreds of millions of free cash flow. Tesla has lots of ambitious projects that require capital expenditure as well as ongoing expenses. Tesla can’t sell its fleet twice. So, this trick can’t be rinsed and repeated a couple of times. The revenue will also go away very quickly, so you shouldn't award it a high multiple and expect it to add to Tesla's value. Fiat requires this pool next year. It needs to be set up this year, but it would surprise me if Tesla were to derive financial benefits starting in '19. Average fleet characteristics will not be known until next year. The benefit is also likely to disappear quickly as all automakers are ramping up EV production. I remain a short as explained in earlier articles here and here. Admittedly, this arrangement seems like a clear win for Tesla. If Tesla receives several hundreds of millions of dollars that will greatly benefit them in the short term. In the long term, this is not a big deal for Tesla.